Sophie is a unicorn expert. And if you do not believe her, she will tell you. And she does that in Sophie Johnson, Unicorn Expert. She knows everything there is to know about unicorns: what they should do, what they should learn, how they should look, what they should eat, even that their horns grow back if they lose them. Sometimes her mother does not agree with how Sophie teaches them (as mothers do not realize that magic is more important than cleaning up messes). However, Sophie is so into pretending that her toys, dolls, pets and even her little brother are unicorns, that she misses the real magic right under her nose. The tone Morag Hood sets with their text is modern. The language and attitude of Sophie will be recognizable to today’s readers. There is a hint of Eloise and Olivia to Sophie’s personality and adventures. The illustrations of Ella Okstad have a sweet but show the flavor of Sophie’s way of doing things (that might be a little more on the naughty then sweet side). They are very vibrant and bright colors. You see a rainbow of colors throughout the book. As well as several actual rainbows painted on walls and paper. Not to mention all sorts of unicorns around. As well as streamers and even a little glitter now and again. This book is for the unicorn fan and the fan of Eloise and Olivia as previously mentioned. The four to seven set will get a kick out of listening and later the slightly older reader can start reading on their own. 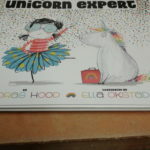 Share the post "Sophie Johnson, Unicorn Expert (Maybe)"